HALLANDALE BEACH, FL – The $1 million Florida Derby (G1) has produced the winners of a remarkable 59 Triple Crown events, including three of the last five Kentucky Derby (G1) winners. 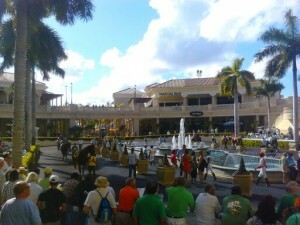 But before the 67th running of the Derby Saturday, March 31, Gulfstream Park will offer a week of events. The week kicks off Monday, March 26 with the Fasig-Tipton Breeze Show at 10 a.m. and runs through Sunday, April 1 with Easter Brunch in Ten Palms. Admission and parking is free at Gulfstream Park. First race post time will be 11:30 a.m. on Florida Derby Day, which features seven stakes races including five graded. Breakfast at Gulfstream begins at 8 a.m. There will also be a mandatory payout of the 20-cent Rainbow 6, which is currently over $4 million, and a guaranteed $750,000 pool for the Late Pick 4 and a guaranteed $500,000 pool for the Late Pick 5. Gulfstream’s Derby Day program will also include the simulcast of Dubai World Cup Day. Doors to Silks open at 8 a.m. There are several dining options at Gulfstream, including Ten Palms, Fountain Club, Frankey’s Sports Bar and a barbeque buffet in Sport of Kings. The official drink of the Florida Derby, the Maker’s Mark Orange Orchid, will be available in a souvenir glass for $12. The Divas and Dudes Hat Contest, sponsored by Maker’s Mark, will take place in the walking ring after the call to post for the eighth race. The Ketel One Make Your Mule Station will be located in front of the winner’s circle featuring three flavors of Ketel One. Havana Club Room will have specials at Corona Beach the entire day along with a live DJ, cigar rollers and Cuban and Latin food specials. For dining reservations at Ten Palms call 954.457.6201. For more information go to GulfstreamPark.com. Monday, March 26: Fasig-Tipton Breeze Show, 10 a.m.
Saturday, March 31: Florida Derby Day. Gates open at 8 a.m.
Sunday, April 1: Easter Brunch, Ten Palms 12-5 p.m.